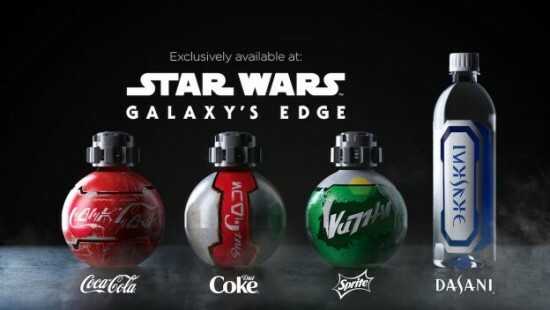 Yesterday at the Star Wars Celebration event in Chicago Disney announced some new products coming to Star Wars Galaxy's Edge from Coca-Cola. Disney along with Lucasfilm Ltd got together with Coca-Cola to come up with specially designed Coca-Cola bottles that are designed to fit authentically within the Star Wars universe. Disney has a long history with Coca-Cola, dating back to the opening of Disneyland Park and the "Refreshment Corner" on Main Street, U.S.A. in 1955. These unique Coca-Cola products were created with storytelling in mind and are unlike anything Disney has done before.